The Japanese general election on August 30, 2009 ousted the Liberal Democratic Party (LDP), which had governed almost uninterrupted for 54 years. In its place rose the Democratic Party of Japan (DPJ) and its leading man Yukio Hatoyama. What follows is a brief profile of the DPJ’s main economic challenges and policies, succeeded by the chief points of contention in the DPJ’s interpretation of Japan’s alliance with the US, the invariable focus of which is military. Now, Japan finds itself at a crucial junction to reassert itself as a regional leader in Asia, whether military or civilian, and it can only do this gracefully by maintaining a relatively undisturbed rapport with the US in economic and military matters. Japan also needs to increase its presence in the Asian economies and, possibly, Asian military affairs, a policy that the US would condone. The road to success for the DPJ in this year’s elections was not unlike that of the Democratic Party in the US. In the wake of the global financial crisis, both parties emerged riding the wave of popular discontent with the party in power. In their leadership, the young and smooth-talking Barack Obama greatly resembled the quirky and unorthodox Hatoyama, both in persona and rhetoric. It was clear from campaigning and advertising that both men aggressively promoted the public perception that their party represented great ideological shifts in their respective states’ domestic and foreign policy. However, with both parties now in power, and in control of the world’s two largest economies, it is becoming clear that the DPJ has stepped into a domestic situation completely unlike that of the US, or indeed the rest of the developed world. Having unseated the rival LDP, which dominated Japanese politics since 1955, the word “change” as used by the DPJ has connotations far deeper than the word embraced by the Obama Administration during the presidential campaign. For many Japanese, the last three decades can be characterized by growing income disparity, unconceivable government spending, and a national debt of over $10 trillion that some theorists now think capable of breaking the economy. With a debt-to-GDP ratio approaching 2:1 left over from the previous administration, the public call for change to Hatoyama has been to somehow stabilize the domestic economic situation while maintaining a high standard of living and social welfare system. Considering that the sectors of the population the DPJ has relied on for support include the unemployed, and the socioeconomic underclass, to whom the party has promised many benefits, stabilizing government spending should be a priority for the fledgling DPJ. Among these promises were pledges of increased spending on healthcare, child support, public secondary education, and guaranteed minimum pensions.4,5 There is no indication that Japan will be able to regain any semblance of control over its national debt, much less institute any meaningful welfare advances, until it manages its spending more deftly. As of now, it seems that the steps Japan’s leadership must take to rein in the economy are unlikely to be as comfortable as much of the population would like. The reality Japan now faces is that increased spending may not be the key to economic recovery, or at least in the same way it has been employed in countries like the US. It is entirely possible that steps to economic recovery will resemble something closer to the period of toil predicted by former Prime Minister Junichiro Koizumi, which may have to focus less on moderate policy transition, and more radical reform. Despite the panic and uncertainty the Japanese economic situation has caused at home, it is a prime opportunity for the young DPJ to step up to the plate on financial foreign policy. Neither the lingering effects of the global financial crisis, nor its inherited economic problems have limited the new party so far from playing its traditional role as a key world power, and may ultimately be a chance for it to forge stronger ties in the future. We have not yet seen enough from this government to analyze its foreign economic policy, but it has identified several goals that will prove essential to its success in the future if realized. They are effectively summarized by the DPJ’s slogan for foreign and economic policy: nyua nyuou (enter Asia, enter the West).6 The first is to maintain amicable economic relations with the US, which it hopes will continue to be a close trading partner throughout hard economic times. The second is to strengthen cooperation within Asia, more specifically between Japan, China, and South Korea, in an attempt to draw these countries’ economies closer. How Japan conducts its foreign relations in the years to come will be closely tied to its economic situation, and may be crucial in facilitating its recovery. Many of the region’s governments are not opposed to this movement: on October 25, 2009 at the 4th summit of the Association of Southest Asian Nations (ASEAN) the chairman included in his closing statement that the ASEAN nations “acknowledged the importance of regional discussions to examine ways to advance the stability and prosperity of the Asia Pacific region. In this connection, we [the members] noted with appreciation… Japan’s new proposal to reinvigorate the discussion towards building, in the long run, an East Asian community based on the principle of openness, transparency and inclusiveness and functional cooperation.”13 A close interpersonal connection between South Korean President Lee Myung-bak and Hatoyama has led to a fruitful relationship between the two nations, and secures the prospect for tightening relations, both politically and economically in years to come.14 Clearly, the ability to persevere throughout this bleak economic period will designate Japan and its new government as a leader among the Asian states, and push it closer to this goal of greater regional cooperation in the future. While this goal may be distant for the time being, it nonetheless offers great insight into the intentions of the DPJ with regard to its foreign policy. There are two main ways that Japan can reclaim its status as an economic leader in Asia. The first is through maintaining its high export levels. Its constant dependence on exports may have contributed to Japan’s quick reemergence from the global recession, as it was in the case of Germany. Yet both the DPJ and the Japanese populace understand that its current-account surplus is unsustainable due to the yen’s buoyancy – Japan is the only Asian state that doesn’t artificially undervalue its currency15 – and unhealthy for the Japanese economy. By encouraging low production costs and labor-wages and allowing the owners of businesses to horde profits, Japan reinforced the income inequality ushered in by the lost decades of the 1980s and 1990s, when an asset price bubble cratered and plunged the entire economy into a complete standstill. It also deepened the rift that began in the lost decades between large, extremely profitable firms and small, floundering business, a further agent of unequal income distribution.16 Hatoyama sees the account surplus, along with the nation’s new income inequality, unemployment, and homelessness, as remnants of Junichiro Koizumi’s policy of “unrestrained market fundamentalism and financial capitalism,”17 words which he pronounces in a disapproving tenor. The second approach is to reassert itself as a financial investing power in Asia. Three economic policies are required for this to happen effectively. The first policy is to encourage the appreciation of the yen. The DPJ seems to favor this, if with some hesitation. Any reticence they feel is on behalf of the exporting farmers, carmakers, and electronics firms who benefit from the weak yen in so far as it gives them a competitive price-advantage.18 Yet only when the yen has a stronger purchasing-power will Japan be able to invest in neighboring Asian markets, and, in this competitive arena of investment, it will be able to trump China, whose exportdependence demands Beijing to artificially undervalue and peg the yuan to the dollar. This would establish a robust Japanese investmentdriven economy as a foil to the Chinese exportdriven economy and would grant Japan all the political sway that attends an investor-nation whose economic presence in neighboring markets has become essential to those nations. This investment is the second policy to reclaim its former economic position in Asia. Once Japan has invested abroad, it will be able to maintain more stable growth. Moreover, once it has secure investments, Japan will definitely be within reach of accomplishing its third economic policy: balancing its currentaccount surplus, an effort that would require a large increase in domestic consumption and import as well as a strong curtailment of Japanese exports. The appreciation of the yen that will follow investment will also boost domestic consumption and import, through the currency’s new purchasing power. To speed this process, Hatoyama has already taken a step towards improving consumption by proposing to lower business taxes and rates (though this has caused some logical unease in economists who cannot reconcile this picture with the country’s huge amount of debt).19 Investment alone will not balance the current-account surplus – in fact, it may exacerbate it. The reason why an investmentdriven economy would lead to a more even current account is that, unlike an exportdriven economy, the appreciation of the yen that would follow investment would be sustainable. Since Japan is currently a major exporter, the appreciation of the yen that results from a strong export-economy is disrupting the continued sale of goods abroad. There is tension in Japanese business between the strength of the yen and the economy’s dependence on exports. The major shift towards investment would dissolve this tension. Now is the time for Japan to capitalize on this opportunity. Because the yen is on the rise20 and other countries’ economies are struggling, there is an investment vacuum in many of the Asian nations. This window will not last for long, as Forbes already predicts that by early 2010 a new wave of Asian foreign direct investment will begin.21 This is the optimal chance for Japan for buy into Asian markets abroad and reestablish itself as an economic power and stabilizer in that region of the world. It is important to note that this issue of Japanese leadership and greater regional cooperation could be one of mild tension. This is particularly due to the commonly antagonistic competition in the international economic atmosphere and the lingering anxiety across all countries about the implications of global recession. Due to Japan’s great historical importance as a major exporter, the leaders of the DPJ must be cognizant of the weight they throw around in international relations. With China and the US not always completely at ease with one another’s role in their economic relationship, Hatoyama and his administration must be certain not to alienate either state with any behavior that could resemble preferential treatment. To illustrate the sensitivity of the situation, the Obama Administration has already expressed its concern that it be included fully in whatever movement towards increased economic integration in Asia might come of Japanese diplomacy with China and South Korea, proposing a summit meeting with the leadership of all the nations involved.22 The US has recently been on the defensive, scrambling to increase diplomatic relations between the itself and Japan amidst remarks by Hatoyama emphasizing less reliance on the US and more cooperation within Asia. Representing such a large economic force, it would be unwise for Japan to act impulsively with regard to its foreign economic policy, as both the US and China look to Japan as a financial powerhouse and much-desired ally. Since China has responded less than enthusiastically to Japan’s visions for economic union within Asia, it would be in Japan’s best interest to think more individually and do some inward reflection before seeking demanding commitments abroad. Still slightly unsure of its role in the global economic playing field both now and in years to come, and saddled with domestic economic problems, Japan is undeniably at a critical crossroads. For its new leadership, this is an opportunity to remake Japan to the same extent as after WWII, and should be viewed and handled as such. However despite this great potential, the DPJ is playing a high-stakes game and may indeed face financial disaster should it mismanage its domestic or foreign policy. Change has come to Japan, and this invariably involves military reform. This is because the real guarantor of Japanese security is not the Japanese military, the framework for which was outlined by the US after WWII and which is unambiguously defined as a self-defense force. Japanese security explicitly lies in the US’ nuclear umbrella and the presence of nearly 50,000 American troops in Japan, the result of a post- WWII status-of-forces agreement between the two powers; this explains the US’ interest in the matter. That the DPJ would want to promise a decreased dependence on the US for Japan’s defense only stirs anxieties in Washington. Yet Hatoyama’s cabinet has not failed to express that the main focus of their new military agenda easily fits under their desire for an “equal” relationship with the US. In fact, this insistence on “equality” has only arisen in topics concerning American military presence. The Japanese do not want all of America’s troops to clear the archipelago. They do not want to be left by the force through which they have been able to limit their defense spending to 1% of GDP.23 And though the specifics of what Hatoyama’s administration will be proposing on this subject are vague, it is clear that the DPJ do not want to evict all of the US troops stationed in Japan. 1 Fackler, Martin. “ Japan Rethinks a Dam, and a Town Protests .” New York Times (2009): n. pag. Web. 29 Oct 2009. Tabuchi, Hiroko. 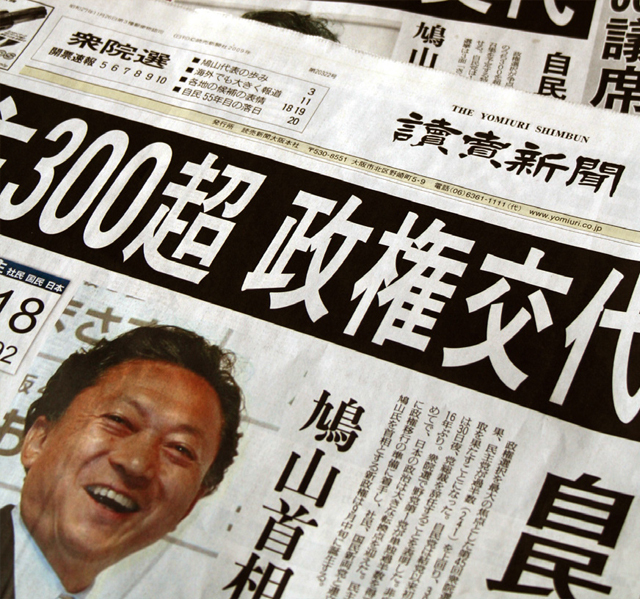 «Rising Debt a Threat to Japanese Economy.» New York Times 20 Nov 2009, Print. “Lost in Transition.” Economist 03 Sep 2009: Print. Ryall, Julian. “Japan election: unemployed turn on the government.” Telegraph 27 Aug 2009. Funabashi, Yoichi. “Tokyo’s Trials.” Foreign Affairs Dec 2009: Print. Harris, Tobias, and Douglas Turner. “Party Time in Tokyo.” Foreign Affairs 8 Sep 2009: Print. Smith, Sheila. “Japan’s New Economic Challenge.” Council on Foreign Relations n. pag. Web. 24 Oct 2009. .
“Japan-China ties to be further advanced: DPJ.” China Daily 02 Sep 2009. Japan. Democratic Party of Japan’s Platform for Government. Tokyo: 2009. Web. 24 Oct 2009. .
Vejjajiva, Abhisit. “Statement at the 4th East Asia Summit, October 2009.” Council on Foreign Relations n. pag. Web. Oct 27 2009. “Hot Air.” Economist 01 Oct 2009: Print. “Stuck in Neutral.” Economist 13 Aug 2009: Print. “New Bosses.” Economist 03 Sep 2009: Print. “Foreign Direct Investment Plunges, But Not in Asia.” Forbes n. pag. Web. 24 Oct 2009. Hookway, James. “Summit to Test Japan-China Supremac y .” Wall Street J ournal n. pag. Web. 24 Oc t 2009. .
“Poodle or Pekinese?” Economist 17 Sep 2009: Print. Bajoria, Jayshree. “Backgrouder: The Rise of Political Opposition in Japan.” Council on Foreign Relations n. pag. Web. 24 Oct 2009. Hatoyama, Yukio. “A New Path For Japan.” The New York Times n. pag. Web. 27 Oct 2009. Kang, David C., and Ji-Young Lee. “Japan’s New Giverment: Hope and Optimism.” Center for Strategic & International Studies n. pag. Web. 24 Oct 2009. Japan. D emo cratic Par t y of Japan’s Platform for G overnment . Tokyo: 2009. Web. 24 Oc t 2009. . The latter would be insured through the admission of the US into any economic community the DPJ intends to create, as the East Asian Community mentioned above; Japan has already promoted US influence in Asia, as its strongest abettor in the Asia-Pacific Economic Community (APEC) and as the defender of American interests in the Association of Southeast Asian Nations plus Three (ASEAN plus Three).